We know we’re still barely out of October, but this is always a great time to take a look back at the year and what it had to offer consumers. From credit cards to fashion to cars, it’s the time of year when everyone’s defining the best of the best. 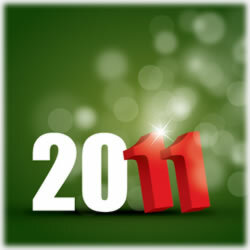 With that in mind, we took a walk down memory lane in search of the most impressive credit card offers 2011 brought us. From MasterCard to Visa to American Express, we’ve been busy plundering through the benefits, perks and drawbacks. Take a look – were you inspired to add any of these to your financial portfolio this year? If not, it’s not too late to apply if you find the “one” you’ve been waiting for all year. This year, it was all about bonus points. Most credit card networks tried – and succeeded – in beating whatever the competition offered. The result? Great savings for Joe Consumer. This fetching offer includes 50,000 bonus points after spending just $3,000 in your first three months. Wondering what it equates to in travel money? It comes to an impressive $625 – which is ideal for holiday travel. Plus, you earn 2 points for every dollar you spend on travel and dining out and all your other purchases earn a point per dollar. There is a $95 annual fee with this offer, but once you delve into the many perks, it most likely will be worth it. It’s a Visa offer, so you’re protected under the giant Visa name, including fraud protection. Chase wowed us with another impressive “up front rewards” dynamic with its Chase Freedom MasterCard. This card allows a $100 cash back bonus after spending just $500 during the first three months. Further sweetening the deal, it also offers an intro 0% APR for the first 12 months for your balance transfers and 6 months on all your purchases. Not only that, but each quarter, new bonus categories are announced and any purchases made in those categories during that quarter earns card holders a bonus 5% cash back. Suddenly, that home improvement was a realistic goal this summer. The Discover network continues to impress. This year, it was all about the Discover More card. In this family of credit cards, there is a student card that parents have been more than slightly impressed with. It provides a powerful tool for young people beginning their credit histories while also giving Mom and Dad peace of mind. Aside from the student card, the classic More card offers an intro 0% APR on both purchases and balance transfers for 15 months. It too offers the bonus categories four times a year and keep in mind, Discover is ranked #1 in customer loyalty – and has been for 15 years in a row. Card holders enjoy around the clock access to an American based account manager – within 60 seconds! There’s no denying Discover has been focusing on customer satisfaction and loyalty – and as mentioned, it’s been the key to its success for going on 2 decades. The Blue Sky Preferred from American Express has been turning heads this year, too. While American Express is synonymous with charge cards, this offer allows for the flexibility of paying over time, making it a great competition in the traditional credit card game. You’ll earn 7,500 bonus points when you become a card member and this is redeemable for what equates to a $100 statement credit. Double points are earned anytime you dine out, book hotels and car rentals. Your other purchases earn at the ratio of one point per dollar spent. There are no black out dates and you can use your points on whatever you choose. The annual airline allowance covers those baggage fees and other in flight purchases nicely. These are just a few of the great offers we saw in 2011. Remember, though, what we define as “best” might be different than your version, so be sure to check out all the credit card offers to ensure you’re getting the best deal for your needs. Be sure and check back with us as we review the best secured credit card offers of 2011 next week.